This exciting diamond engagement ring embodies the spirit of elegance and luxury into a fantastic design. 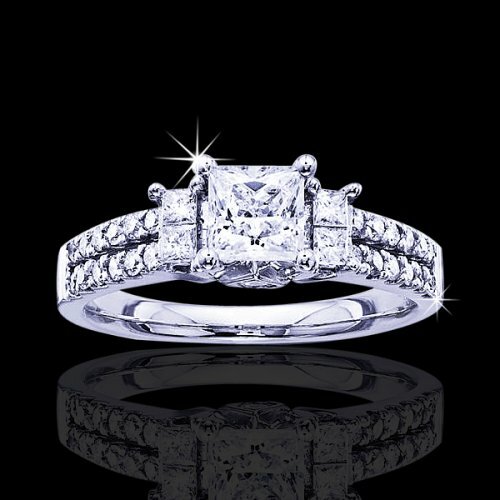 A beautiful princess cut diamond is the central focal point of this mesmerizing ring. This princess cut .75 carat center stone diamond is prong set and features a clarity of SI with a color grade of H.
On the shank, four glittering princess cut diamonds sit next to the center stone and gleam with fiery attributes. Down the shank are eye catching brilliant round cut diamonds. Two secret diamonds accent the ring beautifully. The total carat weight of this ring is 1.30. The charming demeanor of this ring will command attention from everyone who sees it. Beautifully set in high polished, 14kt white gold.